Can you believe it is Spring already? It doesn't seem 5 minutes since Christmas and I am on a mission to revamp my wardrobe, as the saying goes out with the old and in with the new. Top of my most desirable list is shoes, what woman has enough shoes? I love sandals and these are a few of my favourites for this coming Summer season. Lauren from Ralph Lauren, these would be fabulous with skirts and dresses at £85. FitFlop in White with a Jewellery Toepost would be great for casual wear £85. Camper Micro Brown Leather Sandal £110 looks super comfy and would be ideal for work. But for comfort and walking I just need to own a pair of these Michael Kors leather trainers. 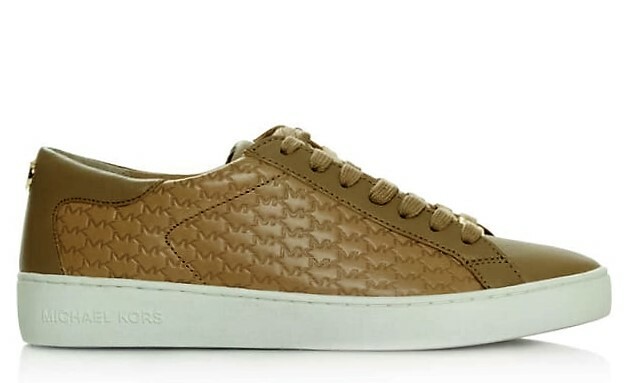 I just love the texture of the embossed leather and although they are not cheap at £130 they would be a staple item in my shoe drawer. Now all I need to do is send hubbie a link to my wishlist just in time for my birthday! What shoes do you like to wear a lot throughout the spring and summer? This post is written in collaboration with Daniels Footwear.